Photo by James Spears. Gibbs High’s Jacob Gasnow runs into CAK’s Russell August (33) and Cody Bailey (24) in the Warriors; victory Friday night in Corryton. Gibbs High School’s football team got stellar performance from quarterback Jay Cade Friday night. But it wasn’t quite enough as Christian Academy of Knoxville held on and nabbed a 42-33 victory over Gibbs in Corryton. CAK, the defending Class 3A State Champion, darted to a 20-0 lead in the second quarter before Cade got rolling. Cade closed out the first half with a 61-yard touchdown scamper to pull the Eagles to within 20-7. He would finish the contest with 323 yards and five rushing touchdowns to make things interesting against the Warriors, who kept their perfect record intact. CAK (6-0) got another stellar passing performance from senior quarterback Charlie High. High completed 22 of his 31 passing attempts and compiled 336 yards through the air and fired a pair of touchdown passes to Franklin Murchison. Murchison made touchdown grabs of 31 and 11 yards and has filled in nicely for University of Tennessee commitment Josh Smith, who suffered a broken collarbone early in the season. CAK, which features one of Knox County’s most prolific aerial attacks, also showed it can produce on the ground. Senior tailback Corey Rathbone finished with 133 yards on 18 carries. He had three rushing touchdowns. He scored on runs of 13, 1 and four yards respectively. “Corey is a great tailback and he has great vision,” Bradley said. “He’s a great fit for our offense. While CAK’s offensive attack was more balanced Friday night, the Eagles (4-2) generated all of their offense on the ground. Cade had four rushing touchdowns and ran for more than 200 yards after halftime. “We knew going in that the key to stopping them was stopping their quarterback,” Bradley said. “He’s a great athlete and a great player. Cade, which closed out the first half with a bang for the Eagles, had second-half touchdown runs of 39, 44, 63 and four yards. 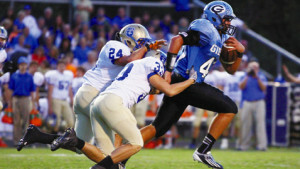 Gibbs, which travels to Fulton Friday for a key District 3-AA showdown, gashed CAK’s defense for 515 rushing yards. CAK also hits the road this week. The Warriors play at Scott County.